In a batch scanning workflow, files are generally scanned with little processing into a system folder. ImageRamp Batch let’s you “watch” folders and automatically process the files for unattended processing. Nearly all scanners and MFP/multi-function printers (digital copiers) provide the ability to scan to a folder, right out of the box so no additional investment in hardware is needed. 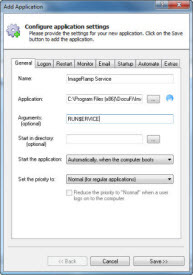 In addition to scanned documents, ImageRamp Batch can process existing files placed in the folder or PDF print streams. When folders are automatically polled, files placed in watched folders are processed according to preset profiles. Watching can be started and stopped by an ImageRamp administrator within ImageRamp Batch or Batch can be integrated as a Windows’ service. As a Windows Service, the “watching” is started anytime the computer is booted. In addition to any security features implemented as part of Batch, Windows Service offers additional security features. Instructing ImageRamp to watch folders is simple. Set the profile which is the “processing template” with instructions for how to process each file. We’ll discuss more on profiles later. Then, simply browse to the Folder to Watch and Destination or output folders. At the end of the operation, the original files are placed in the Backup Folder. Setting up ImageRamp Batch to be monitored automatically with Windows’ services is done through the Windows Service interface. What Tasks Can Be Implemented with the ImageRamp Batch Profile and Applied to the Watched Folder Files? For example, an “Invoice” profile might capture invoice number, vendor name, and invoice date as index information captured from barcodes as well as despeckle, deskew and autorotate the pages. 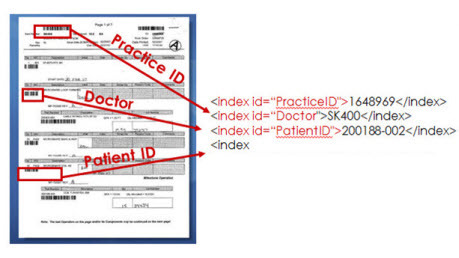 A dental lab report profile might capture the patient identity, dentist name, and date; clean the image; and place the file in a file system under the dentist’s name. ImageRamp can lower the cost of processing a document using proven technologies to automate many common tasks. 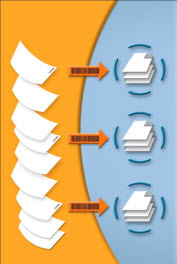 Many batch scanning projects use barcode separator sheets which Batch can use to name, split, route and bookmark the file. Create the cover sheets within Batch or use one of the many tools freely available to create cover sheets. There are free text font libraries that integrate directly within a word processing system such as Microsoft Word, online cloud services that email you a printable PDF, or installed applications to create sheets.